While half of all users in the region use under 8.8GB a month, there exist a small population of ‘power’ users that consume a significant portion of the traffic, which may explain why ISPs are looking to throttle traffic. HOWEVER, before you defend your ISP, just remember that Unifi fair usage threshold (though not yet implemented) is 60GB while Maxis has a threshold of 40GB. Basically the fair usage threshold is the point at which your ISP thinks you’ve consumed more than your fair share, and begins to slow down your speed. Now, it stands to reason–that since a large portion of users in the Asia-Pacific don’t use anywhere near the Fair Usage Policy threshold, and these users would never hit the limits imposed by the ISP. So why then imposed a fair usage policy? After all, even when you average out the bandwidth of all your users, you don’t expect anywhere near your fair usage thresholds. The average profile of an Asia Pac user shouldn’t much different from the average profile of a Malaysian user. After all, Malaysian isn’t super-urban like Singapore and Hong Kong, and we’re not as rural as Indonesia or Philippines. Which makes TMs decision to not throttle torrent traffic on Unifi or implement a Fair usage policy look very pragmatic indeed. So we have a case of two major ISPs here. TM who have a Fair Usage policy on their contract, but for very good reasons don’t enforce it, it’s always been TMs position to test out an unfettered and unthrottled internet–introducing the Fair Usage policy only when needed–and so far they’ve not needed it. Maxis on the other hand imposed it straight out of the box, and ‘claim’ they need it–but all the data from both Sandvine and TM suggest they don’t need a fair usage policy– provided they’ve allocated enough infrastructure to support 40GB per user per month. So why bother? 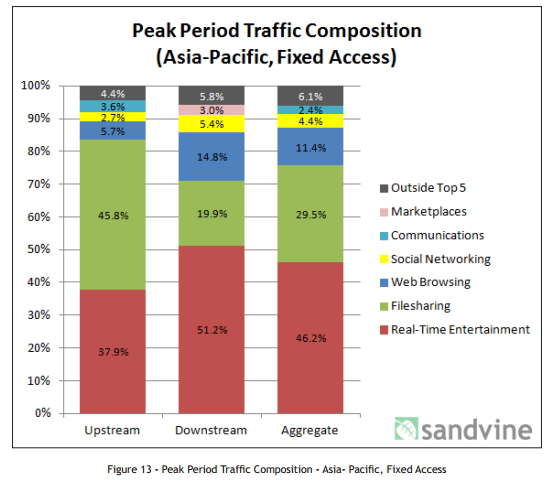 On that same note, the percentage of torrent traffic in the Asia-Pacific has also decreased year-on-year. Last year 33% of all internet traffic along fixed lines was bitTorrent traffic, now it’s just 29%. Most of that shift can be directly attributed to Real-Time Entertainment which saw an increase from 42% to 46%. The interesting thing about this is that most Real-Time Entertainment protocols use legal content–the same can’t be said for bitTorrent. As I blogged last year that the best way to reduce pirated content in any region is to increase the availability of legal content, and we’re seeing some of that in Malaysia–and hopefully we begin to see more in the form of hyppTV and a Netflix here. It seems that most of the global research suggest that there isn’t a need to throttle internet speeds of anyone in Malaysia–not even specific protocols like bitTorrent. If the ISPs really had allocated the ‘fair amount’ of bandwidth per user per month, it’s unlikely they’d need to go through the hassle of logging peoples traffic usage just to throttle them later. So then why do they do it? Your guess is as good as mine.